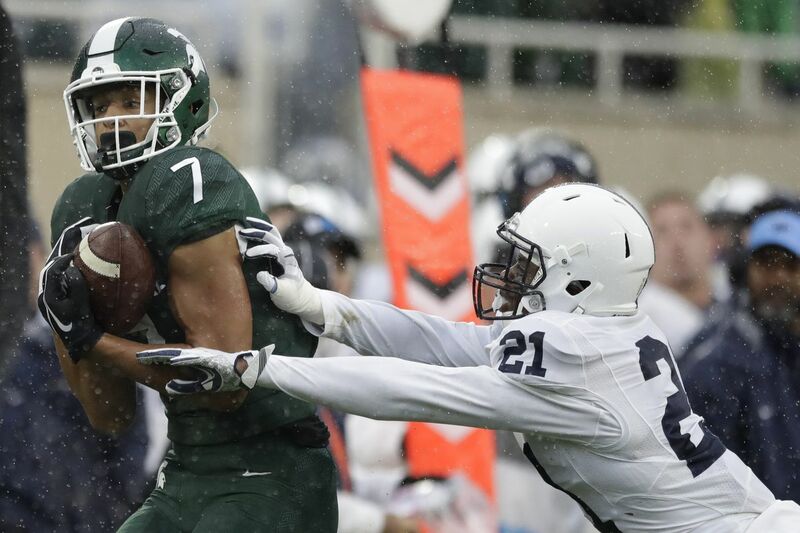 Penn State cornerback Amani Oruwariye pushes Michigan State wide receiver Cody White out of bounds. Penn State cornerback Amani Oruwariye has been named as one of 14 semifinalists for the Paycom Jim Thorpe Award honoring the nation's top defensive back. Oruwariye, a fifth-year senior, has two interceptions this season and is second in the Big Ten with 1.6 passes defended per game, a figure that ranks him 11th in FBS. He also is sixth on the Nittany Lions in tackles with 33. The award is given to the nation's top defensive back based on on-field performance, athletic ability, and character. Three finalists for the award will be named on Nov. 19, with the winner announced Dec. 6. Penn State announced that its Nov. 3 game at Michigan will kick off at 3:45 p.m. and be televised by ESPN.